Five years after Folila, its latest energetic rock album on which the cream of the future of pop music collaborated, the Malian duo Amadou & Mariam is back at last with one of its trademark lazy, sensual and highly danceable gems. The godparents of the Afrobeat and modern pop melange, of the mix between traditional and electronic music, are back with a new album, La Confusion, produced by Adrien Durand. He’s the orchestrator of the project Bon Voyage Organisation, mixing African and Asian influences, disco and electro and gives a new sheen to the concept of world music. 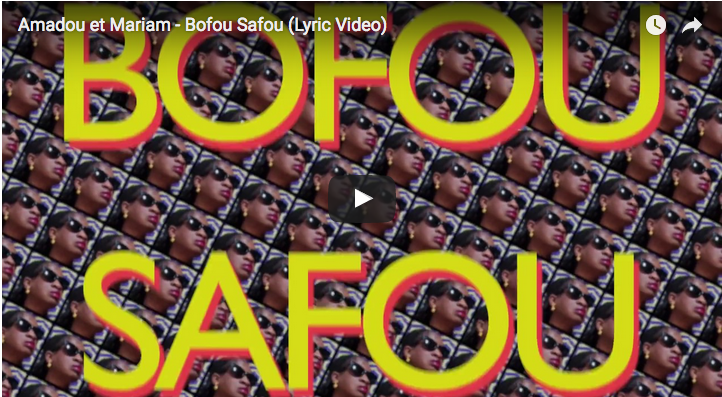 ‘Boufou Safou’, the first single from this next album, with its bouncy lyrics in Bambara and French, is a small gem of slow-paced Afro-disco, carried by Mariam’s magical voice, gently poking fun at the nonchalance of African boys. This is also a hit song that places the duo in the same electro-dance territory explored a few years back with producer Damon Albarn on the fabulous ‘Sabali’. This is a tribute to personalities such as Francis Bebey or William Oneyabor who, very early on, started mixing traditional music and experimentations. And with the help of remixes by Africaine 808, Fatima Yamaha, Henrik Schwarz and Pakem, Amadou & Mariam are back on the dancefloor. Click here to watch the video.